Did you know that, in addition to their supreme powers, the Greek gods were endowed with the special ability to change the course of card games? Well, at least that's the case in Zeus on the Loose! As you figure out how harness the strengths of the various gods within, you'll sharpen strategic thinking along with valuable addition and subtraction skills. A quick warning about Hera: Though she may be the most powerful goddess in the game, don't get on her bad side or else she might wind up helping an opponent steal Zeus and win! Sometimes a game just lands in your lap. In my case it was a copy of Zeus on the Loose: A Card Game of Mythic Proportions, a new card counting game from Gamewright. I was on Twitter and Coiled Spring announced a simple competition for the game and I won. Once it dropped through my letterbox, I opened it up and read through the rules, ready to take it along to Afternoon Play, a regular monthly boardgame meet at a coffee shop in the city centre of Birmingham. I got the game out and we played it a couple of times in between longer games, in this case Ghost Story (a very difficult co-operative game about Chinese monks ridding a town of ghosts and monsters), Railways of the World: The Card Game (laying tracks, connecting cities, and transporting goods using cards rather than lengths of track), and Red Empire (my favourite game of Soviet Politburo Politics). It was agreed that it was indeed a nice little filler. So I will probably take it along next time. The idea in Zeus on the Loose is that the Greek god has gone missing from Mount Olympic and it up to you to grab him and return him to the summit. This is done by playing numbered cards – bringing the card total to a multiple of ten (ten, twenty, thirty, forty, and so on) means that can grab Zeus and getting to the summit (represented by the card total getting to a hundred or more) with him in tow will win a player the round. In addition, Zeus’ fellow gods – Aphrodite, Apollo, Ares, Artemis, Athena, Hera, Hermes, and Poseidon – will sometimes help you out in your efforts over your competitors. The winner of each round is awarded a letter. The first letter won by a player is a “Z.” On later rounds a player will be awarded the letter “E,” and then a “U,” and then an “S” for winning. The first player to win enough rounds to spell out “ZEUS” wins the game. Designed for two to five players aged eight and up, Zeus on the Loose consists of sixty cards, a Zeus figure, and a foldout rules leaflet. Two thirds of the cards are numbered between one and ten, whilst the remaining cards depict the various gods and their special abilities. Each player starts with a hand of four cards and can only play one card per turn, which is placed face up on Mount Olympus card pile. If a numbered card the new number is added to the total of the cards so far, the players keeping a running total from turn to turn. If a player brings the current total to a multiple of ten, he gets to grab Zeus and place the Zeus figure in front of him. If when a player puts a number down and another player has the same number on a card in his hand, he can immediately take his turn by playing the card in his hand. Sometimes this means that other players will miss their turns because turn order continues normally from the interrupting player. For example, the turn order consists of Dan, Geoff, and Paul. If Dan plays a seven card and Paul has a seven card in his hand, he can immediately play it with play order continuing normally – that is, to Dan rather than Geoff who misses his turn. Alternatively, a player can play a God card. There are eight types of these, each of which provides a particular effect. These either alter the current total value of Mount Olympus, let the player steal Zeus from another player, or a combination of both. Lastly, a player has to draw his hand back up to four cards at the end of his turn or he must play with fewer cards until the end of his next turn. Physically, Zeus on the Loose, is very nicely put together. The number cards are clear and simple, whilst the God cards are done in an attractive cartoon style. The rules leaflet is easy to read and in addition to the rules, contains a description of each of the Greek Gods that appear in the game. 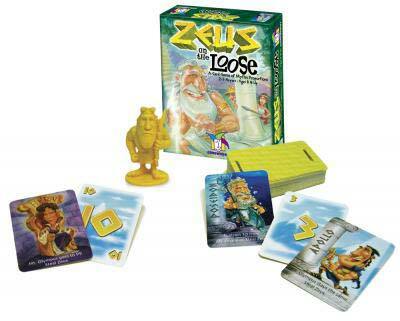 Like many games from Gamewright, Zeus on the Loose has a strong educational aspect. The most obvious one being the arithmetic necessary to play, but there is also the information about the Greek pantheon in the rules and what it teaches about game play – that you need to pay attention to play well. Otherwise, a player will find himself losing turns as his competitors steal turns from him. 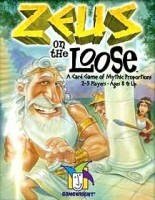 As intended, Zeus on the Loose is a well-designed educational game. Its designers have got the age range about right, making the game suitable for the classroom or for families with children of that age group. Adults will find the game play a little limited, more so if they are practised gamers. Nevertheless, Zeus on the Loose: A Card Game of Mythic Proportions is a nice little game that great for families and great as a gift for families. Add a Review for "Zeus on the Loose"